Oratile was the President for the University of Botswana Wildlife and Environmental Conservation Society (UB-WECS) and is now its advisor. He is a researcher who presented his first paper in 2014 at the Environmental Education Association Of Southern Africa. Oratile presented conferences Namibia and the 1st International Conference On Innovation For Sustainability Under Climate Change And Green Growth that was held in Johannesburg (South Africa) in May 2015. Elena is an international law graduate with a passion for sustainability and environmental law from Italy. She is currently a scholar of the Yenching Academy of the Peking University based in Beijing. Her interest in the protection of the environment inspired her to start reporting stories on sustainability from China, Hong Kong, Singapore and beyond. Elena has a bachelor’s degree in law, and a five year experience working with environmental NGOs and citizen initiatives. For the past two years she has been freelancing as an environmental journalist for both Macedonian and international online media. Alina is from Lahore, Pakistan and is currently studying at the Lahore University of Management Sciences. She is an active member of The LUMS Environment Society and organises talks, conferences and seminars on sustainable development. Maikel is working for Green IT Amsterdam, this consortium of Green IT leaders has a mission to increase energy efficiency and decreasing carbon emissions by scouting, testing and exploring smart IT solutions. Around 45 organizations are participating in the Green IT Amsterdam consortium. Adriana is a creative industrial designer, Msc. EcoDesigner, Storyteller and Visual thinker with particular interest in sustainability, systemic design and social innovation. During her master studies at the Politecnico di Torino, she received a scholarship to do her master thesis in Germany about urban Agriculture as essential core for social and urban development. She has done projects about systemic design to race and improve sustainability in different systems like the Public Kitchen, which was selected by the contest RECIPROCITY design liège 2015 THE TASTE OF CHANGE to be exposed at the Espace Saint Antoine, Musee de la Vie Wallonne in Liege- Belgium. - Who said cookies can’t fight malnutrition? Than has a bachelor degree in Banking and Finance and he will be attending a post-graduate course in the UK in September 2015. He is very excited to be a reporter because it is such a great opportunity to inspire people. Renata has finished her master in sustainable fashion at Esmod after studied at London College of Fashion and RMIT (Styling), MEGT (Business & Management) and Cásper Líbero University (Marketing). She founded KNOT in 2013 – a fashion brand - focuses on endemic hotspots conservancy, design innovation and community development. Awarded for EESC – European Economic Social Committee, Silver Winner in the Creative Conscience, Finalist in the Federal German award - Bundespreis – Eco Design and Berlin Fashion Week. KNOT fosters partnership with brands and governments to evolve the Brazilian sustainable development. Peter is a journalist with PUNCH Newspapers in Nigeria. He is also a member of the United Nations International Youth Council. In February 2015, Peter became an Associate Fellow of the Royal Commonwealth Society, London, an award given in recognition of those who demonstrate a sustained commitment to promoting the values of the Commonwealth. Peter also founded the Help A Child Initiative to help improve the lives of poor children in his community. Peter has been involved in sustainable activities as an undergraduate in the Faculty of Environmental Studies. Misra studied Political Science and International Relations and completed a masters program on Social Anthropology at University of Oxford. During her studies, she received the EU scholarship for her studies on environment related EU Acquisition Chapter. Emanuel is a third year undergraduate student in architecture at Université Abou Bekr Belkaid de Tlemcen in Algeria and speaks Swahili, English and French. He is the French winner of the multilingual essay contest on the new UN sustainability agenda, participated in a youth Global Forum and present my paper work on the topic of sustainability at the United Nations. - Taking Sustainable Development Goals (SDG’s) to the next level by translating them into African local languages. 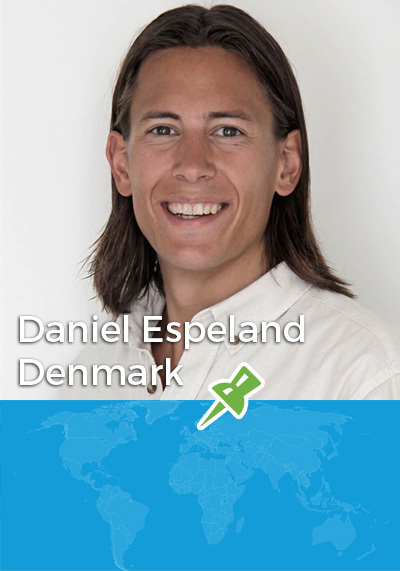 Daniel is currently working as a development consultant for Leaderlab in Copenhagen, mainly dealing with the LAUNCH Nordic Innovation Challenge. Daniel holds two master degrees in the fields of International Business and Supply Chain Management from Copenhagen Business School, Denmark and EGADE Business School, Mexico. His dissertation concerned sustainability aspects of the global cocoa value chain. Daniel has also funded a social business that is working with importation of chocolate products from Mexico to Denmark. Ana is an Economist with great interest in Agriculture, Green Economy and Sustainability. She has a multicultural background, is well-travelled and has gained solid working experience in different continents. Throughout her career she has acquired a thorough knowledge of different agri-value chains, from rough commodities up to Fine Wine. She is passionate about finding innovative projects, communicating people’s initiatives, and learning more about new market trends (especially the upcoming certifications schemes). - How much is your Waste worth? African Egyptian Entrepreneur who has been working in the entrepreneurship field for 5 years, Mostafa has established G.O.L (Goal Oriented Learners), one of the most successful youth communities in Egypt. G.O.L is improving the skills of Egyptian youth to be more qualified candidates for the job market by offering training on Social Entrepreneurship and Career Development & Soft skills. G.O.L is funded by Ashoka Youth venture, which made it possible for Mostafa to deliver G.O.L training to more than 8000 students and graduates in Egypt since 2011. Mostafa has a background in engineering and now also works full time at Mercy Corps Egypt and IIE (International Institute of Education) representing two international companies; he is the Middle East & North Africa representative at StudySearch (Nigeria), and Egypt representative at All events in city (India). - From Ideation to sustainable organizational transformation! Simone is 24 years old, originally from Amsterdam but moved and traveled quite a lot. Based in Amsterdam for now, but willing to move abroad (not sure where yet) again around February 2016. ‘Think Globally, Act Locally’ describes best how she looks at SD challenges and taking care of the world. She has a BSc in Political Science and a MA degree in European Public Policy with a focus on environmental policy and transition management. - INSTOCK AMSTERDAM - are you ready to rescue some food? James is a PhD graduate student from Singapore. His current research is on self-powered microdevices for detection and remediation of waters. The science has brought him to six countries over 3 years for academic conferences. Having spent formative years in Japan post-March 2011, he believes in the balance between development and sustainability. Dillorom is a lawyer and entrepreneur. She co-founded Washington DC-based non-profit organization Tashabbus in 2010, where she runs an online legal clinic for citizens of Uzbekistan. She is one of the co-founders and a mentor at Sahar School of Social Entrepreneurs and is a president of youth educational opportunities initiative Grantlar.uz, which helps the Uzbek youth to improve educational potentials. She has a law degree from Uzbekistan and an LL.M. in international human rights law from the University of Notre Dame Law School. Rachel has a Bachelor of Science degree in Environmental Science and is currently pursuing a Master of Public Health degree with a concentration on Environmental Health and Toxicology. Much of her experience in sustainability has come from volunteer work and implementing sustainable change on a local level. Being involved in this field isn’t so much choosing a career for Rachel, but more so following her passion. Mirjana currently works in two professions; Architecture and Journalism. She gained her Master diploma in Architecture 2010 and she has finished LEED GA course, Think thank MOOC - The ideal city of the 21st century and Tesla Doctrine House project. She writes for international magazines doing stories and interviews with authors that are the stars of today's creative industries. She is a member of the Serbian Chamber of Engineers and Journalist Association. Her projects are mostly based in Europe and the Middle East where she has published numerous articles and won several awards. By nature she is an enthusiastic and open-minded person who is dedicated to contributing to education and profession. Jidan is a junior student majoring in major in environmental engineering at the Sichuan Normal University. Her biggest dream is that she can contribute to the environmental cause through her effort. Maria is a materials engineering student with a strong interest in environmental issues and sustainability. She is a member of the Association of Young Entrepreneurs of the Universidad Simon Bolivar (AJE-USB). Maria was selected as one of 10 Climate Champions of Climate Generation program from the British Council Venezuela for young environmental entrepreneurs and she was the representative of Venezuela at the 2011 International Student Conference on Environment and Sustainability in Shanghai, China. She volunteers in some foundations and NGOs. Akanimo is from Akwa Ibom State Nigeria. He loves natural science and was trained at the University of Calabar. He also studied Corporate Communication at International Institute of Journalism in 2009. Akanimo is naturally good at mobilizing others to do what he believes in and he is a prudent manager of resource. He initiated wasted bins in local schools, trained kids to understand the mantra no waste, no mosquito, no malaria. 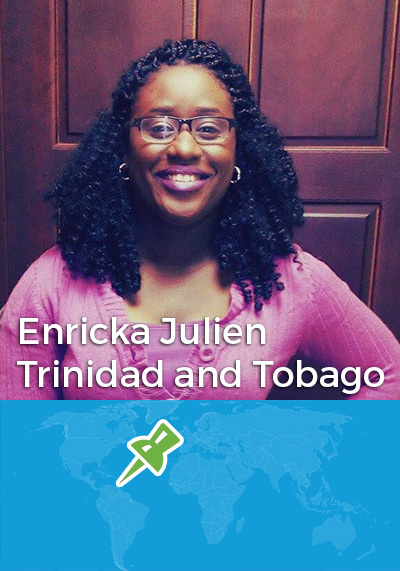 Enricka has a Bachelor of Science in Agribusiness, Minors Gender and Development, Communication and Extension from the University of the West Indies, St Augustine, Trinidad. Her first journalistic endeavour was the blog for YPARD on Rural-Migration in Trinidad after which she was selected as an onsite social media reporter at ICT4ag13 in Kigali, Rwanda. She is also the creator of the blog Ebites. The blog’s goal is to bring awareness to the global community about the challenges national smallholder farmers’ face the objective of which is to provide a platform for discussion on key agricultural issues and to initiate linkages for the development of the agriculture industry and its stakeholders. BSc Agric Hons , MSc Ecology, TechWomen Alumni 2014 (USA). 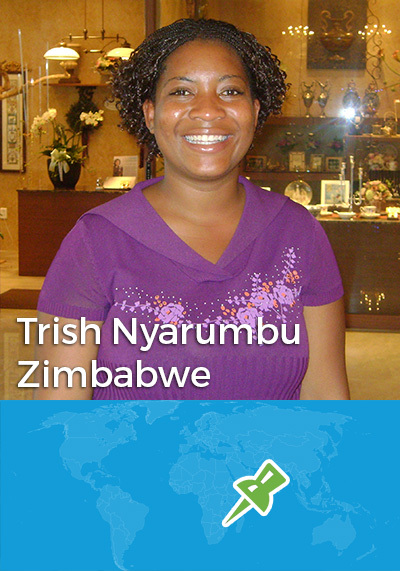 Trish holds a diverse knowledge base being an agriculturalist/ecologist with several international trainings from China, South Korea, India and the Netherlands. Her career objectives are focused at ways to meet food security needs through sustainable agriculture while preserving the environment. - The need for food and development - where does the fate of water bodies lie?